The champion and runner-up pictured are Camryn Miller from Highland Middle School and Grant Beard from Northmor. Shown in the top 12 are as follows: Row 1: Lorelai Myers, Camryn Miller, Keely Pearl, Grant Beard, Anique DiLorenzo, A.J. Brehm, Dane Creswell and Bryson Baker. Row 2: Jonah Allard, Robert Webster, Ciara Giamarco, and Ella Creswell. SPARTA — Another Morrow County Spelling Bee is in the books and there is a new champion. 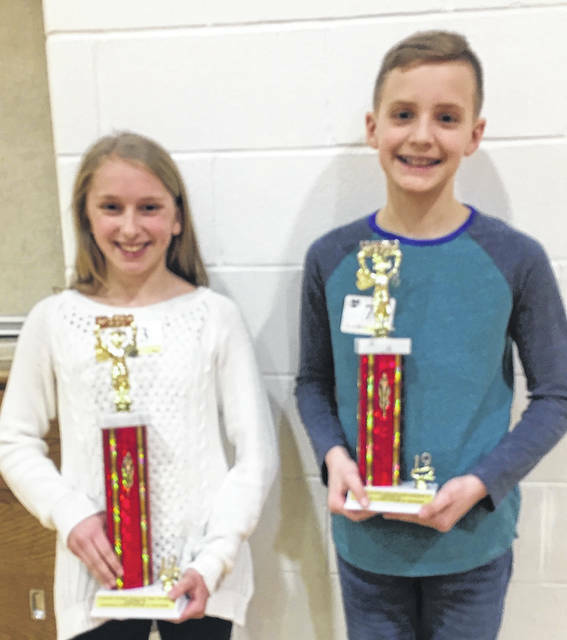 After 7 rounds of competition, Camryn Miller, a seventh grader from Highland Middle School, is the Morrow County Spelling Bee Champion with the winning word, “delinquent.” Grant Beard, a sixth grader from Northmor, was the runner-up. 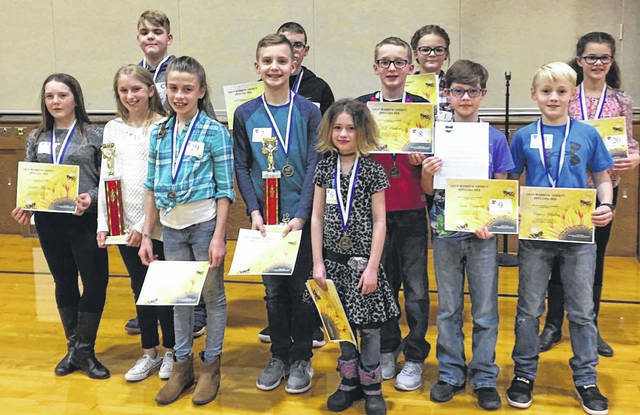 Twenty-nine spellers competed in the bee held on Jan. 24 at Highland Elementary School. Others placing in the Top 12 included A.J. Brehm, 6th grade from Cardington-Lincoln Local Schools, Keely Pearl, 5th grade from Cardington-Lincoln Local Schools, Ciara Giamarco, 8th grade from Cardington-Lincoln Local Schools, Lorelai Myers, 6th grade from Cardington-Lincoln Local Schools, Anique DiLorenzo, 4th grade from Highland Local Schools. Jonah Allard, 6th grade from Highland Local Schools, Robert Webster, 8th grade from Highland Local Schools, Ella Creswell, 6th grade from Northmor Local Schools, Bryson Baker, 5th grade from Northmor Local Schools, and Dane Creswell, 5th grade from Northmor Local Schools. Every speller received a certificate and medals were awarded to the top twelve spellers. The champion and first runner-up received trophies. Trophies and medals were donated by Morrow County House of Trophies. The top twelve finishers will be invited to participate in the Tri-County Spelling Bee held at Mid-Ohio ESC on Thursday, Feb. 14 at 6:30 p.m. The alternate date is Feb. 21. The public is welcome to attend the spelling bee. Mid-Ohio ESC is located at 890 West Fourth Street in Mansfield. Mid-Ohio Educational Service Center provides high quality, cost-effective, specialized academic/ therapy support services and professional development for school districts in the Central Ohio Region. These include offering alternative educational options, preschool education and printing services, as well as conference center facilities.